In today’s market realities, it is important to have tools that would help you in building a more robust business model of your today or future business. Today, we live in a technological culture that offers a lot of tools for covering, almost any personal, professional or business need, in minimum price or at no cost. Due to this proliferation of tools, it is important to present to most useful ones and the most suitable for the specific purposes aiming at be used. One of such tools is The Business Model Canvas, a tool aiming at the modeling of new business and startups. a strategic management template for developing new or documenting existing business models. It is a visual chart with elements describing a firm’s value proposition, infrastructure, customers, and finances. Is a visual tool that can help strategically the new, or would be, entrepreneurs to conceptualize the basic business process of their company or of their potential start-up. By presenting visually the potential trade-offs among the involving business processes, these can be aligned with the vision, goals and the scope of an organization, and, if needed, to be changed, omitted, altered or replaced. The usage of the template is very simple and intuitive while there are available a lot of resources for its implementation. An excellent case study about the usage of the Business Model Canvas in the area of startup’s investment has been written by Martin Luenendonk. Its title: “Investment Readiness Level Guide: How to Boost Your Startup’s Attractiveness to Venture Capital Investors using the Business Model Canvas“. It is an excellent and thorough case study I highly recommend to read every entrepreneur and business owner. 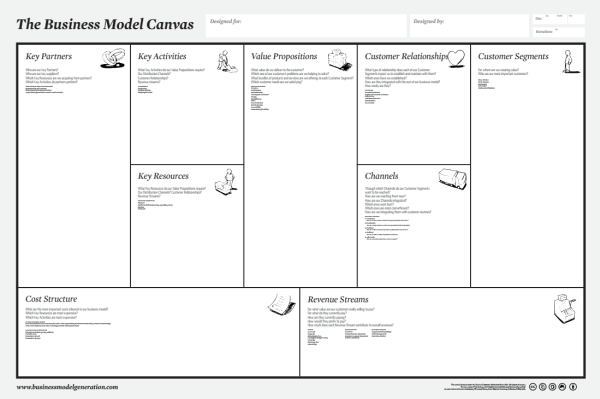 Business Model Canvas is a versatile tool can be used in many situations and business areas. But its higher value is that helps you to conceptualize all the main areas of your business and focus on the most important areas that would impact its operation and its development.